"Make wishes. There are a million chances, that your dreams will come true soon." - V. Kasta. In our gallery you can purchase unique, handmade wedding invitations, baptism invitations, anniversary invitations, that are created by an artist-designer. 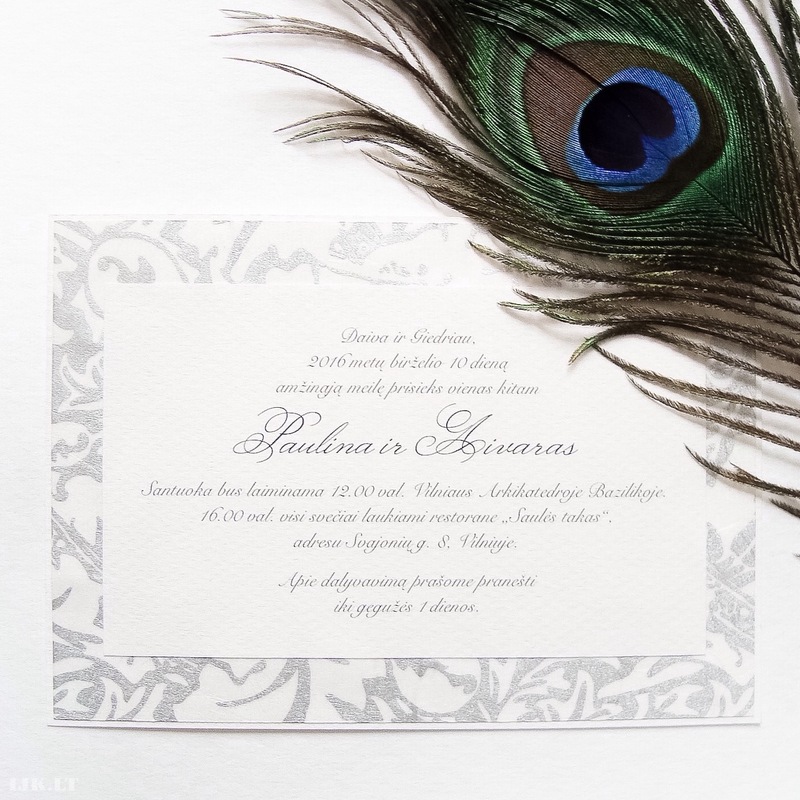 Invitations are made from high quality paper, decorated with luxurious details and artist's illustrations. You can also make a custom order for a special design. Set: invitation card, envelope. Card is made from white and pink cotton paper. Envelope is made from white shining paper. Set: invitation card, box, silk fibre inside. Invitation is made from milk white cotton paper and gold paper, dekorated with white gold paper flower. Vintage style. Recycled light and brown (with golden dust) paper. Linen string. Set: invitation card, envelope. Card is made from light silver paper with embossed flowers and grey silver paper. White envelope. Set: invitation card, box. Invitation is made from transculent gold paper. Scrolled. Ivory box. Marinistic invitation for a sea themed festivity, in a jacht or a ship, with blue stripes, a metal anchor and a sailor knot, made of a linen string. Sensitive accents in sand gold tones. Light recycled and handmade paper. Red felted heart. White linen string. Envelope – cover. Eco-friendly. Set: invitation card, envelope. 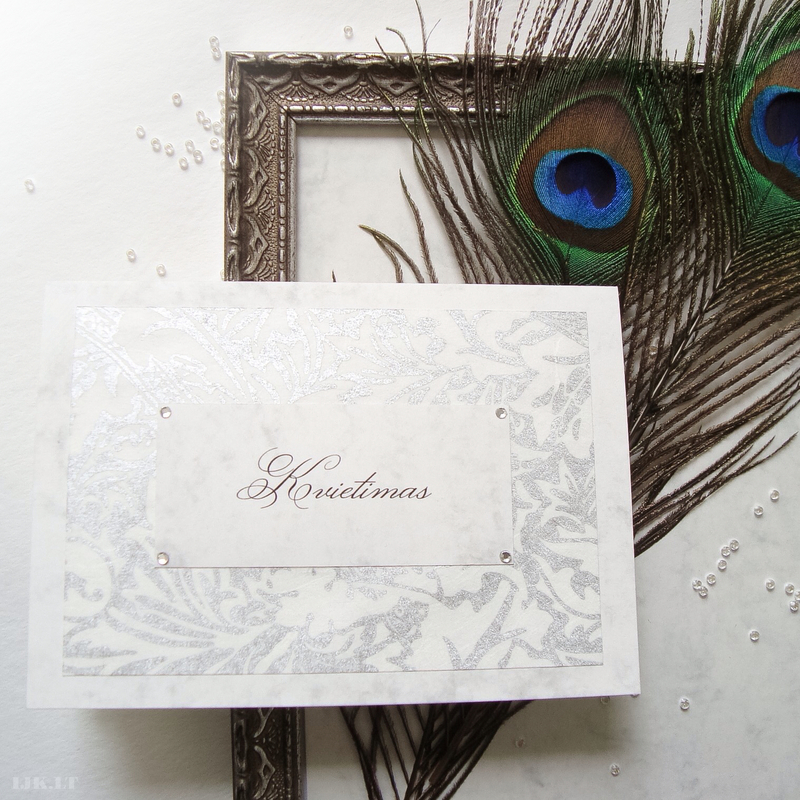 Card is made from shining white gold paper and brown (with gold dust) paper. White gold envelope. Ivory and gold (glitter) color. Relief paper. Satin ribbon. Luxurious, classic. Luxurious, XVIII century inspired. Ivory, brown, gold colors. Stripes. Satin ribbon. Swarovski crystal. Initials. Natural, recycled brown paper, ivory relief paper. Decorated with silk paper with aged gold color leaves. Cozy, rustic eco style for wedding in the village. Natural, recycled brown and gray paper, linen string. Photo: invitation outside and inside. White relief (factured) paper. Golden accents. White silk fibre. Satin ribbon. White relief paper. White silk fibre. Gold and silver accents. Metal details. Set: invitation card, envelope. Card is made from white paper. Envelope is made from light green cotton paper, decorated with another paper inside. It is possible to change color and pattern. Set: invitation card, envelope. Invitation is made from natural, recycled, off-white paper and silver paper. Envelope with names. Inspired by old manor times. Aged like. Silk paper with silver ornaments, light gray marble texture paper. Silk paper with silver drawings and milk white cotton paper. Eco chic style. Set: invitation card, envelope. White invitation with blush pink accents. Made from white, shining paper and white relief paper. Illustration – cherry blossoms, sakura. Handmade shining envelope. Invitation with artist illustration – mandala. Options: with quote or personalization (bride's and groom's names, wedding date). Natural craft brown paper and white cotton paper. For an elegant beach themed wedding. Light, pastel tones, gold and white paper. Seshells, sea stars and pearls illustration. Envelope made of shiny white paper. Nautical wedding invitation (light blue water color, sand gold, warm white) with anchor illustration and linen string with nautical knot. You can buy it without string. Texts should be written in a specific language characters (e.g. in Lithuanian texts must be Lithuanian letters, in Russian texts must be used the Cyrillic alphabet). We do not correct mistakes. Guest lists must be presented separately, numbered, in a regular singular case, with the title ("Dear", etc.). If the text is slightly different to each other (e.g. to change a few words in the plural to the singular), and these changes are small, they can be specified in parentheses after names of guests. We have an archive of our wedding invitations collections, where you can find ideas for your custom orders.